Reliable protection at any size. High capacity allows for 20% more containment. Stretchable side "wings" help provide proper and comfortable fit. Dryness layer pulls fluid away from the body to help protect skin from wetness. 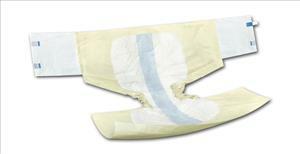 Ultra-absorbent core keeps moisture away from the skin. Skin-safe tabs allow for multiple re-fastenings. Wetness indicator displays when brief change is needed. High Capacity with Leg Cuffs, Bariatric, 65"- 94" (165 cm - 239 cm). Beige. 32/cs, 8/bg.